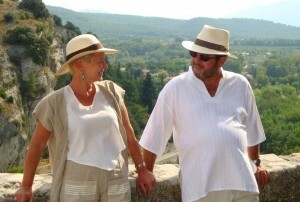 We are both of Belgian origin, we have had the project to move to the South of France for several years. My wife , Françoise had a work opportunity to relocate to Pau, and we discovered Béarn and were immediately captivated by the charm , beauty , authenticity of the countryside with the simplicity and friendliness of the local population. We are passionate about the local lifestyle and have fallen in love with this « Enclos » béarnais and « Gave » stonework at the foot of the Pyrenees mountains. Having started my life in the restaurant and hotel business, the preparation of local typical delicacies is a real passion of mine. Naturally we wish to share our big house and our love of the area with passing guests. I discovered working with wood as a second interest of mine while searching in the four corners of the region for furniture and knick knacks to furnish the house. I continue to give a second life to objects in my workshop which is located in a converted barn.